Okay, I’ll say it. 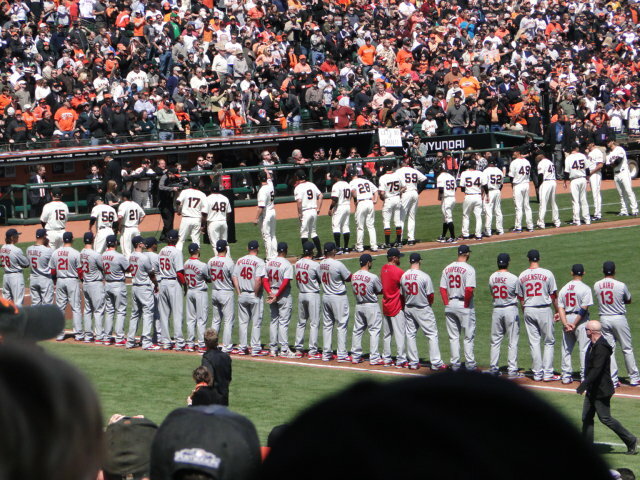 I’m not ashamed to admit that one of my very favorite baseball moments of all time was the Opening Day Ceremonies on April 5, 2011, following that glorious 2010 World Series Championship win . 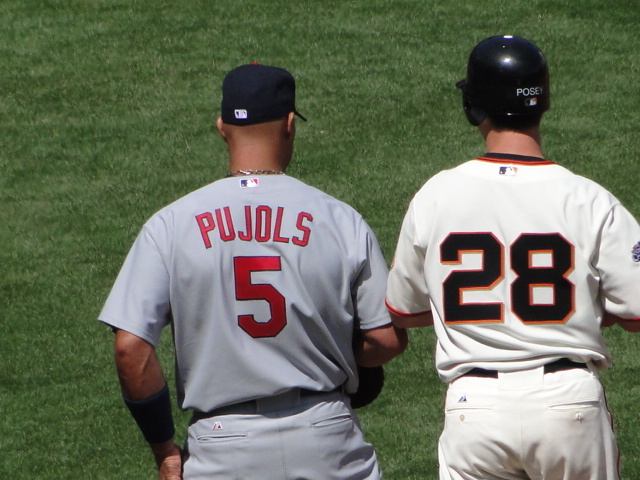 The game was between the San Francisco Giants and the St Louis Cardinals. So today was just the icing on the cake for me. 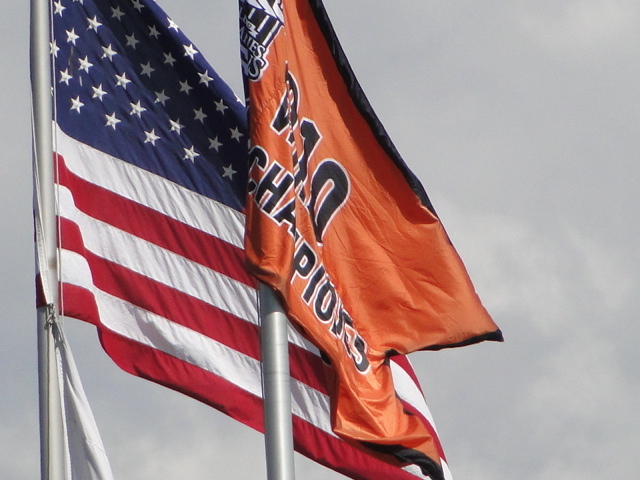 The same teams were playing, and the championship flag was again being hoisted above the park to remain for the entire 2013 season so that all who crossed our threshold could see what a magical place they had entered. But today, instead of being at the game, I was watching from my comfortable chair, all decked out in orange and black, with a box of Kleenex and a paper bag (to dispose of the used tissues) nearby. And I did pretty good until they introduced the Cards Manager, Mike Matheny, and the crowd broke into near hysteria in support of this fellow, another of my very favorites. And I lost it, never to fully recover for the rest of the ceremony. I’m not sure why I was so emotional today, but it probably had something to do with the affection the Giants fans feel for their team, and the entire organization for that matter, but also for anyone who has anything to do with the Giants! The crowd cheered just as loud for each of the St Louis Cardinal players who were former Giants as they did for the current Giants themselves. It’s been a long dry spell, this post, post-season, and finally today, after five months we have our kids back home ready to dance around the mound, and the plate and the field. “It’s the sweetest thing I know of, just spending time with you” ……..as if I was singing the song to each of them individually as they walked out onto the field. And I meant it. The only thing missing were the Navy Jets, but since our country’s broke I guess we can’t afford them, with the sequester and all I mean. ….I think they say St. Louis is the best because fans are as enthusiastic as in other places but are probably more fair-minded. You can get booed here some, but you’re not going to get embarrassed. Here, you never see nastiness from our fans. If you like knowledgeable people who are fair-minded to the other side, this has got a chance to be the best. Cardinal fans have even been known to give a standing ovation for a strikeout, which occurred when Larry Walker, a newcomer, came to bat for the first time as a Cardinal, promptly struck out and received the standing ovation. One fan explained they stood because they were saying, in effect, thanks for coming here kid. We’re glad you’re a Cardinal. They have the reputation of not only being some of baseball’s most knowledgeable fans, but also the most polite. So I’m reflecting on this as I’m watching the pre-game ceremonies yesterday at AT&T Park in San Francisco. This was the first league home game for the Giants since they won the World Series back in November and, believe me, it was a big, big thing! Huge! I don’t know who plans these events, but for some reason, the first thing they did was introduce the visiting team, the St. Louis Cardinals, one at a time as they usually do. They individually trotted to their place in line on the field to a smathering of applause, some boo’s, the usual stuff. Introduced “Train”, the band, live, who performed their local hit, “Save me San Francisco” in honor of the World Series Champions. At the end of the song, the Giants started streaming into the park from Centerfield, walking at first, then breaking into a trot as they made their way to the 3rd base line, where they, too, would stand at attention, well, sort of. This was to the roar of 42,000 crazy fans who were delighted at just the sight of them! The members of the Giants organization were then introduced, one at a time, beginning with the bat boys, and including the clubhouse assistants, the clubhouse managers, trainers, assistant trainers, massage therapists, the coaches, the bench and finally the starting players for this game. Then a memorial tribute was given to those from the organization who had passed away during the offseason. The Color Guard was then introduced. The singing of the National Anthem was then played which ended in the fly-over of the Navy jets. During the National Anthem the flag was beautifully rolled out onto the full scope of the field displaying its colors. Now all of this really nice ceremony took place while the St. Louis Cardinals were standing on the 1st Base line, still as steel, and as patient and polite as you can possibly imagine. After the National Anthem was played, the festivities continued, though the players did get to retreat to their dugouts. We were then introduced to a gentleman who had been a season ticketholder since 1958, and Brian Wilson presented him with the World Series game ball. During this time the big screen was showing the most memorable scenes from the playoffs to the wild applause of the fans, and this was followed by presentation of the MVP and Babe Ruth awards from the World Series. Approximately 45 minutes later, Willie Mays presented Bruce Bochy with the World Series flag which was passed on down the SF Giants line to end up with Brian Wilson, who then trotted out across the field and up the stands and hoisted the World Series flag above the stadium. It was emotional and very impressive; at least to me and the other fans. But I kept watching the St. Louis Cardinals and wondering what they must be thinking during all this. Maybe they were really enjoying it and thinking about when it would be their turn again, and maybe they were happy for the Giants and their fans. Maybe they admired the Giants ability to overcome huge obstacles that allowed them to come to this point. But more than likely it’s possible they were just thinking, “For pete’s sake, would you hurry up and get this over with ?” Which it finally did, 45 minutes later. I had noticed during the introduction of the St. Louis Cardinals, one of the fellows in front of me, probably in his mid 30’s, politely clapped and applauded as each Cardinal was introduced. Remembering the best fans in baseball, I thought this is probably something the Cardinals did for us when we played on their home turf. Later I approached this man and mentioned to him how impressive it was that he applauded the visiting team members. He just smiled and said “It’s just a game. Isn’t that what we’re supposed to do”? I asked him where he was from and he said he lived in San Francisco, but his grandma lived in St. Louis. Uh Huh! And it passes down from generation to generation. His dad’s probably the same way. Anyhow, I had a good feeling throughout this game. Not that we’d win or lose, but that we’d experienced probably the worst of baseball fandom the previous week, and we were experiencing some of the best of baseball fandom today. The spirit of St. Louis is alive and well and the spirit of baseball is too. This entry was posted in A1 Baseball, General, San Francisco Giants, St. Louis Cardinals and tagged 2010 World Series, 2011 Opening Day, AT&T Park, best fans in baseball, Championship Flag, classy Cardinals, giants 2011 home opener, MLB, opening day, posey, sf giants, St Louis Cardinals, World Series Champions. Bookmark the permalink.